In this series of posts, I summarize the 13 basic principles of unconditional parenting as described in Kohn's book, Unconditional Parenting. I include insights and interpretations gleaned from other resources. The information-based posts run in parallel with a series of personal accounts of how I attempt to apply these principles in my own mothering.Scroll to the bottom for links to all posts in the series. I often refer to my style of parenting using a term coined by Alfie Kohn: "Unconditional Parenting." But what exactly is unconditional parenting? What makes it different from any other form of parenting? Most importantly, how do we actually do unconditional parenting in real life? To address these questions, I'd like to begin a series of posts where I investigate the underlying principles of unconditional parenting. Let's get started with a general description. 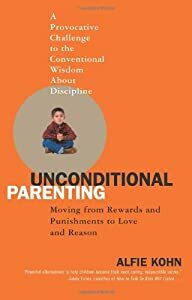 Kohn uses the term "unconditional parenting" to make it distinct from the dominant parenting paradigm that tells us to treat our children conditionally: reward the child for behaviors we like, and punish or ignore behaviors we don't like. In contrast, unconditional parenting avoids behavior modification tactics. Instead, the focus is on understanding the child's underlying needs, emotions, and motives. We can circumvent the need to use rewards or punishment at all by addressing a child's state of mind and by validating their feelings. Limits and boundaries are maintained through mutual trust, respect, open communication, and guidance towards self-regulation. The upshot is that children actually feel our unconditional love because they receive our compassion no matter how they act - even though we don't condone certain behaviors. However, unconditional parenting is much more than the avoidance of praise and rewards. For me, the practice of unconditional parenting is a quest or process. I view it as a philosophy, a set of guiding principles, and a frame of mind. I don't get this parenting thing right all the time, but I keep coming back to a foundation rooted in unconditional parenting principles. It's an approach that works for me because it feels like I am truly mothering from my heart. Kohn argues that it's hard to offer a set of do's and don'ts of unconditional parenting (see p. 117 in Unconditional Parenting). Still, a good starting point for understanding and trying to practice unconditional parenting comes directly from Kohn's book. In it, he describes thirteen "Principles of Unconditional Parenting" (chapter 7) that can be adopted by anyone wanting to practice a gentle, compassionate, and highly effective style of parenting. In an upcoming series of posts, I will cover each of these Principles of Unconditional Parenting. I'll summarize them and provide additional resources where appropriate. Since most of the principles are easier said than done (by a long shot! ), I'll also include a parallel series where I explore my personal challenges with each. Once I cover the basic principles of unconditional parenting, I'll tackle the more controversial issues of rewards and punishment. Please feel free to chime in with comments, questions and insights because this is still very much a learning process for me and many other parents. We all gain strength and knowledge from each other. I truly believe we can heal the world by becoming better at caring for our children, by loving them unconditionally. I hope you'll join me on this journey to discover more about unconditional parenting! Great! I'm looking forward to this series! There are lots of blogs about attachment parenting that cover very similar topics. But for parents outside this community, it can be hard to find that info. I'm glad we found each other! I'm going to check out the Yahoo group as well. I'm excited for this series as well! Great subject!